All our smart phones have shiny flat AMOLED displays. Behind each single pixel of these displays hide at least two silicon transistors which are mass-manufactured using laser annealing technologies. While the traditional methods to make them uses temperatures above 1,000°C, the laser technique reaches the same results at low temperatures even on plastic substrates (melting temperature below 300°C). Interestingly, a similar procedure can be used to generate crystals of graphene. Graphene is a strong and thin nano-material made of carbon, its electric and heat-conductive properties have attracted the attention of scientists worldwide. 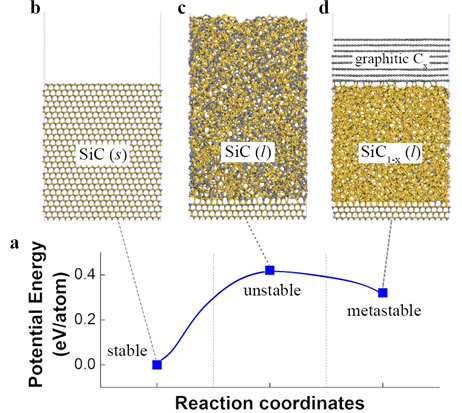 High-resolution transmission electron microscopy shows that after just one laser pulse of 30 nanoseconds, the silicon carbide (SiC) substrate is melted and separates into a carbon and a silicon layer. More pulses cause the carbon layer to organize into graphene and the silicon to leave as gas. Molecular dynamics simulates the graphene formation mechanism. The carbon layer on the top forms because the laser-induced liquid SiC (SiC (l)) is unstable.